The Cleveland Cavaliers won the deciding Game 7 of the NBA championship. It´s the first time since 1964 that a Cleveland team has won a first major sports championship. Of course, for Cleveland it´s a great success. In the Google News Boxes, there was also a winner: Espn.go.com had by far the highest visibility. 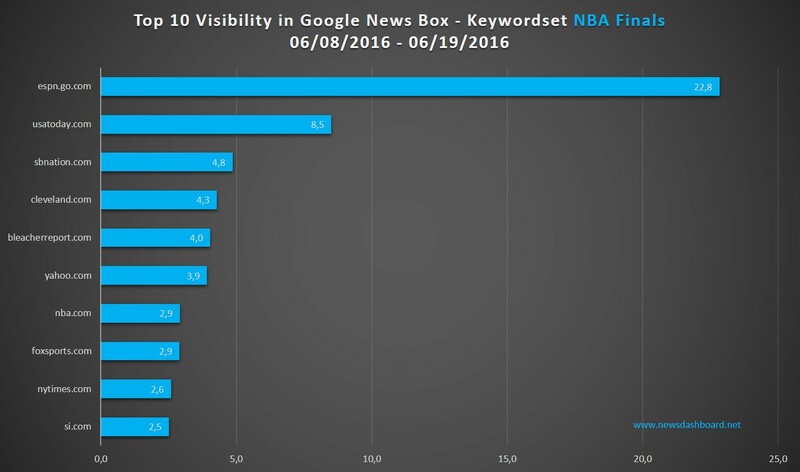 We already analyzed the Google News visibility regarding the NBA finals after the first three games. Now, finally, we look at the time between game 3 and the last game number 7. Which news publisher had the highest visibility in the Google News Boxes? Are there any differences compared to the first games? Espn.go.com reaches by far the highest visibility in the Google News Boxes to the keywordset. espn.go.com is by far in front regarding the visibility in the Google News Boxes. It´s not very surprising that espn.go.com is still on first position – the sports site had a visibility in the Google News Boxes of 22.8 percent. On second position is usatoday.com with 8.5 percent visibility. If we compare the Top10 between 06/08/2016 until 06/19/2016 with the results of our first analysis we can see that there are some differences: While in our first analysis between 06/02/2016 and 06/08/2016 bleacherreport.com was on third position, in the second time interval sbnation.com and Cleveland.com passed by. Nevertheless, one can say that espn.go.com is the clear winner of the Google News Boxes regarding our NBA finals keyword set. During the first three games as well as during the last four games the sports site was always on first position and had the highest visibility in the Google News Boxes. Let´s now take a look at the final day, when Game 7 took place. 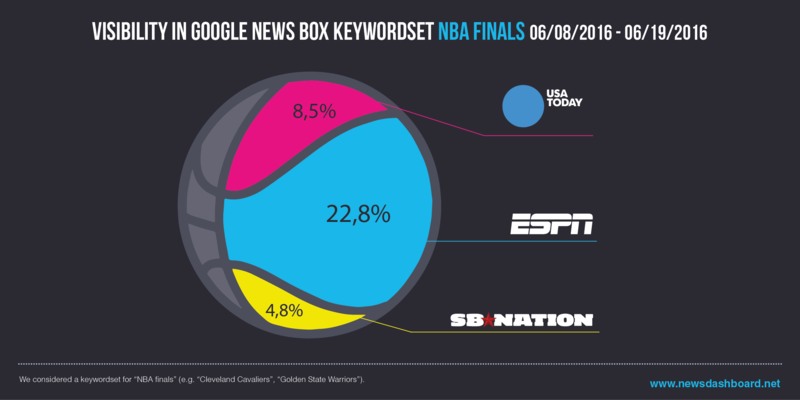 We analyzed the Google News Box of the keyword “The NBA finals”. There, we can see that there is no clear winner in that News Box on 06/19/2016. There is a high fluctuation in the Google News Box of the keyword “The NBA Finals”. While in the night until noon cbssports.com and wsj.com were on first position, in the afternoon until midnight sbnation.com, nba.com, espn.go.com and usatoday.com could conquer the popular first position in the Google News Box. All in all we can see that espn.go.com won the NBA Finals as the Google News Boxes visibility is concerned. But the Google News Box of the keyword “The NBA finals” at the day of the decisive game the site couldn´t win. Many other news publishers successfully got a position in that specific Google News Box as well.